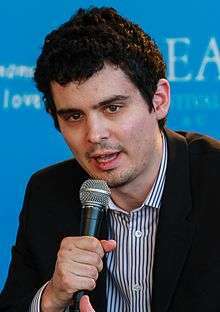 Damien Sayre Chazelle (born January 19, 1985) is an American film director and screenwriter. He made his directorial debut with the musical Guy and Madeline on a Park Bench (2009). In 2014, he wrote and directed his second feature film Whiplash, based on his award-winning short film Whiplash (2013). The film premiered at Sundance Film Festival and went on to receive five Academy Award nominations, including Best Picture. Chazelle received a nomination for Best Adapted Screenplay. He is also known for co-writing 10 Cloverfield Lane and writing and directing La La Land, both in 2016. Chazelle was born in Providence, Rhode Island, on January 19, 1985. He is the son of Celia (Martin) Chazelle, a writer and professor of History at The College of New Jersey, and Bernard Chazelle, the French-born Eugene Higgins Professor of Computer Science at Princeton University. Filmmaking was his earliest ambition, but he subsequently wanted to be a musician, and struggled to make it as a jazz drummer in high school at Princeton High School. Chazelle has said he had an intense music teacher, who was the inspiration for the character of Terence Fletcher in Chazelle's breakout film, Whiplash. Unlike the film's protagonist Andrew Neiman, however, Chazelle stated that he knew instinctively he never had the talent to be a great musician, and after high school, pursued filmmaking again, describing it as his first love. He studied filmmaking in the Visual and Environmental Studies department at Harvard University and graduated in 2007. Chazelle's debut as a writer and director was the film Guy and Madeline on a Park Bench. Chazelle has shared screenplay credit with director Ed Gass-Donnelly on The Last Exorcism Part II, 2013. He is also credited as the screenwriter on 2013's Grand Piano, a thriller that has an anxious pianist dealing with a death threat during a concert. Chazelle has stated in interviews that he was working as a 'writer for hire' but had the ambition to direct his own script. Chazelle described Whiplash as a writing reaction to being stuck on another script. 'I just thought, that's not working, let me put it away and write this thing about being a jazz drummer in high school.' He stated he initially did not want to show the script around, as it felt too personal, and "I put it in a drawer." Whiplash gained interest from producers, but nobody initially wanted to make the film. Chazelle's 85 page script was featured on Black List in 2012 as one of the best unmade films of that year; it was eventually picked up by producers, including Helen Estabrook, who suggested J. K. Simmons for the role of the teacher, Terence Fletcher. A short film, made as proof of concept, was accepted at the Sundance Film Festival 2013; financing was raised for the film, and in 2014 it was released to an overwhelmingly positive critical reaction. Whiplash won the Sundance Film Festival Short Prize in 2013 as a short and in 2014 the top audience and grand jury awards in the U.S. dramatic competition as a full-length feature film. The film also took the grand prize and the audience award for favorite film at the 40th Deauville American Film Festival. On January 15, 2015, Whiplash received 5 Academy Award nominations, including Best Adapted Screenplay for Chazelle. It won three of them, Best Supporting Actor for Simmons, Best Achievement in Film Editing and Best Achievement in Sound Mixing, on February 22, 2015. Chazelle co-wrote 10 Cloverfield Lane, which was released on March 11, 2016. Chazelle was brought in by J.J. Abrams' Bad Robot Productions to re-write a draft, with the intention of Chazelle directing. However, Chazelle ultimately chose to direct Whiplash instead. His musical, La La Land, starring Ryan Gosling and Emma Stone, opened the Venice International Film Festival on August 31, 2016 and will be released in the United States on December 9, 2016. It has received rave reviews from critics. ↑ "Chester French – She Loves Everybody – Limité Magazine". limitemagazine.com. 1 2 "Damien Chazelle interview, Blacklist". ↑ Rottenberg, Josh (February 13, 2015). "Damien Chazelle's wild, crazy ride to the Oscars with 'Whiplash'". The Los Angeles Times. Retrieved July 8, 2015. ↑ "'Whiplash' Is Sundance's Hottest Film, A Music-Themed Drama Starring Miles Teller and J.K. Simmons". ↑ "'Metacritic Reviews of "Whiplash"". ↑ Bahr, Lindsey (May 14, 2013). "'Whiplash': Sundance-winning short to become full-length feature – BREAKING". Entertainment Weekly. CNN. Retrieved January 19, 2014. ↑ Zeitchik, Steven; Mark Olsen (January 25, 2014). "Sundance 2014 winners: 'Whiplash' wins big". Los Angeles Times. Tribune Company. Retrieved January 27, 2014. ↑ Richford, Rhonda. "'Whiplash' Takes Top Prize in Deauville". The Hollywood Reporter. Prometheus Global Media. Retrieved September 13, 2014. ↑ "2015 Oscar Nominations". Rotten Tomatoes. Retrieved January 15, 2015. ↑ Rome, Emily (March 15, 2016). "'10 Cloverfield Lane' director explains why they changed the movie's ending". HitFix. Retrieved July 15, 2016. ↑ Ford, Rebecca Ford (July 9, 2015). "J.K. Simmons to Reunite With 'Whiplash' Director for 'La La Land' (Exclusive)". The Hollywood Reporter. Retrieved July 12, 2015. ↑ Vivarelli, Nick (June 17, 2016). "Damien Chazelle's 'La La Land' to Open Venice Film Festival in Competition". Variety. Retrieved 2016-06-21. ↑ Ciras, Heather (August 31, 2016). "Emma Stone and Ryan Gosling's 'La La Land' gets rave reviews in Venice". The Boston Globe. Retrieved December 3, 2016.